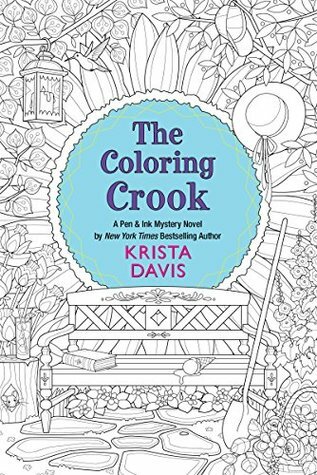 The Coloring Crook by Krista Davis is the second book in the cozy Pen & Ink Mysteries series. This series has the unique set up of the protagonist being an artist who draws adult coloring books so to celebrate that the publisher has made the cover of hard copies a drawing to be colored in by the reader. Each book in this series does have it’s own contained mystery to be solved so books may be read out of order if choosing. There of course is character building carried over story to story though so reading in order is always the best option. In the first book readers were introduced to Florrie Fox who by day manages the Color Me Read bookstore in Georgetown, Washington D.C. and in her off time draws for adult coloring books. Florrie has settled into her new life and has even started a new romance. The bookstore has been booming and Florrie has made plenty of friends with the bookstore’s coloring club. One of the club’s members shows up with a rare find that would be worth a fortune but when she’s found dead the next day Florrie suspects foul play and will do anything to find out what happened to her friend. The Pen & Ink Mysteries have returned readers to the unique and wonderful characters and setting from the first book of the series. As much as I loved the creativity of the cover of the books the stories inside have also been fun to read too. There’s again plenty of suspects to keep a reader guessing through the mystery to go along with the fun setting and characters so I’ll be sure to be back to this series in the future. Krista Davis is the New York Times bestselling author of the Domestic Diva Mysteries and the Paws & Claws Mysteries. Several of her books have been nominated for the Agatha Award. Krista lives in the Blue Ridge Mountains of Virginia with two cats and a brood of dogs. Her friends and family complain about being guinea pigs for her recipes, but she notices they keep coming back for more. Please visit her at http://www.kristadavis.com. This is such an adorable premise for a cozy! Great review, Carrie! Wonderful review Carrie. Glad this one is just as good as the first in the series. I loved the uniqueness of the first book.